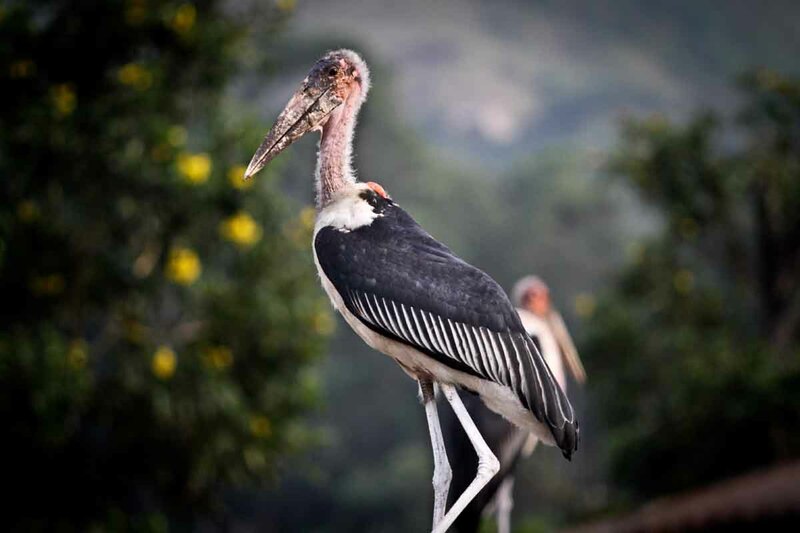 A marabou stork rests on a market rooftop in Kasese district, approximately 350Km (220 miles) west of Uganda’s capital, Kampala. It breeds in Africa south of the Sahara, occurring in both wet and arid habitats, often near human habitation, especially waste tips. It is sometimes called the “undertaker bird,” due to its shape from behind: cloak-like wings and back, skinny white legs, and sometimes, a large white mass of “hair.” Its also one of the largest flying birds in the world. As well as being one of the ugliest looking creatures, the Marabou is also a contender for the bird with the longest wingspan Out of the 19 species of stork, the Marabou is the largest. If you see this bird around your area it means there is filth, garbage and dirty stuff in your neighborhood! Clean up the area and the birds will go somewhere else. Great photo… and the poor bird can’t help it !! I saw a couple of those birds lounging at the Sheraton – there was no filth, garbage or dirty stuff in sight. You are my inspiration, I possess few web logs and rarely run out from post :).